This is just mind-boggling to me. 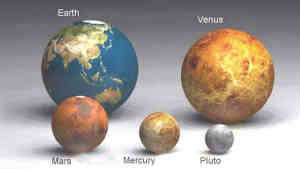 This website shows the size of our Earth in relation to other planets and stars in the known universe. It's a big world, but we're tiny compared to the Sun. And our Sun is tiny compared to many other stars--a fact it turns out I'm thankful for. It's hot enough out already with our sun, without having to orbit around a star like Antares. You couldn't even go outside without applying SPF 1,000,000,000,000,000,000,000. It really goes to show me that I have no sense of proportion. And that's a good thing. If the Hitchhiker's Guide has tought me anything, it's that I can't afford to have a sense of proportion. That, and to always bring a towel.